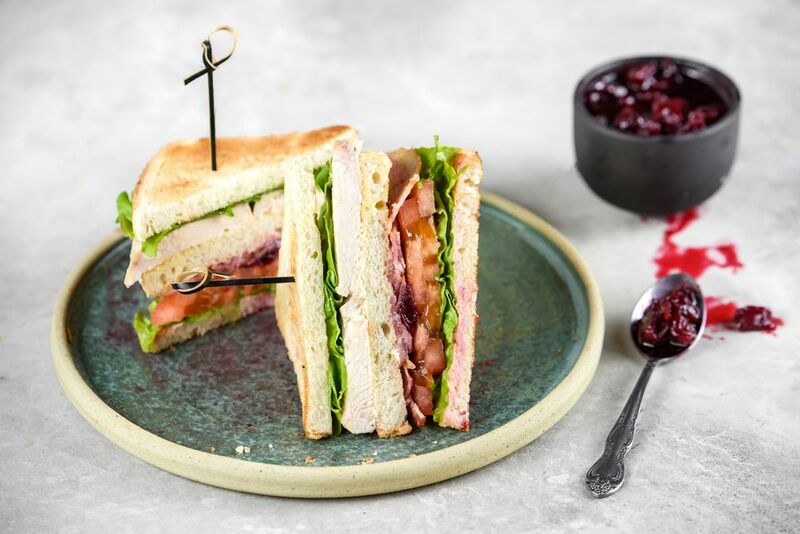 This turkey club sandwich can be made with deli meat and it'll be really good. But wait until you make it with your own leftover turkey. We love putting some leftover cranberry sauce on the sandwich, but if you don't have any, maybe you have some of the canned stuff in the back of your pantry. Toast the bread and spread one side of each slice with mayo. Place one piece of lettuce, sliced tomato, optional cranberry sauce, and the bacon on one slice. Place a second slice over these ingredients, mayo-side down. Spread this top bread slice with mayo, and place the turkey and another lettuce leaf on it, then top with the remaining slice of bread. Cut the sandwich into triangles diagonally.